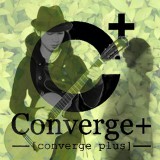 Converge+ is ‘Dance Music Duo’ of Takashi Sasaki (graphic designer,calligrapher, sound creator, guitarist, and developed his DJ, live performance abroad), and DJ ENDO (performed the resident DJ of "SAW@AIR" the official party of Satoshi Tomiie's SAW.RECORDINGS, and actively plays as a quest DJ throughout Japan and in the overseas clubs). In past, 'Global Jam' published by Swedish label Inkfish was chosen as "10 Must Hear Progressive House Tracks Week 3" by beatport, and their music was selected as the Editorial Picks in Remix Contest of Booka Shade which Beatport sponsored. Recently, their tracks were released worldwide, for example, as baroque Records in UK, King Street Sounds/Nite Grooves, and EIGHTH DIMENSION in US. Their sound from a multidirectional viewpoint will always accomplish evolution in future.